Devon Energy announced a $1.4 billion joint venture with Sumitomo Corporation. Sumitomo will invest $1.4 billion in exchange for 30 percent of Devon's 650,000 acres in the Cline Shale and Midland-Wolfcamp Shale. This deal is equivalent to $7,200/acre! The deal is generating a lot of industry attention. Wunderlich Securities expects to see more JV's in the Permian Basin as this deal is "the first block buster JV in the Midland Basin and we expect more to come". There is a lot of drilling activity in the Permian Basin and Lynden Energy has significant holdings in both the Wolfberry and Cline Shales. Lynden's West Martin/Wind Farms project and Tubb project include 6,509 net Wolfberry acres and is now producing over 900 boe/d per the company's latest release. The core area (West Martin/Wind Farms and Tubb) can be valued at $25,000/acre to $30,000/acre given the amount of current development valuing it at $150 million to $200 million. Lynden's Mitchell Ranch acreage is in the heart of the Cline Shale, in fact Devlon has significant Cline holdings adjacent to it. 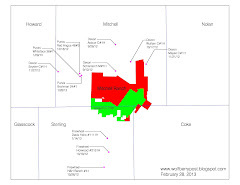 Should one value Lynden's 34,150 net Mitchell Ranch acres at $7,200/acre, LVL's market cap would soar! With the increased industry attention to the Permian Basin and the Cline Shale, it is likely that larger companies are either looking at Lynden or will be looking at Lynden. Lynden is a unique company as it's one of the few small companies in the basin that has significant acreage. Lynden is sitting on a great asset that is in the heart of the Permian activity and is in a great position to take advantage of the recent JV activity.